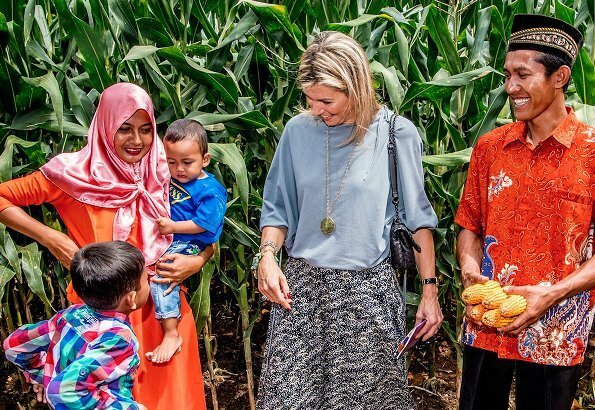 Dutch Queen Máxima is currently making a two day financial working visit to Indonesia. 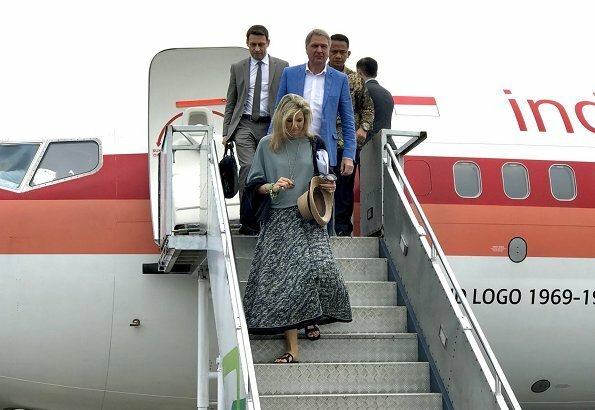 Queen Maxima arrived at Soekarno–Hatta International Airport of Jakarta, the capital of Indonesia yesterday. 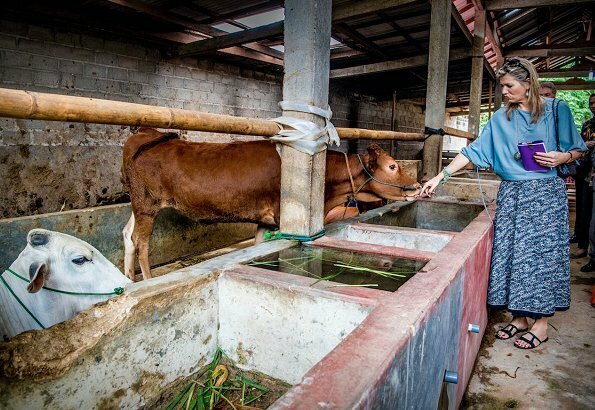 Today, the Queen made a working visit to Lampung state in Sumatra island, which is characterized by agriculture and met with farmers. 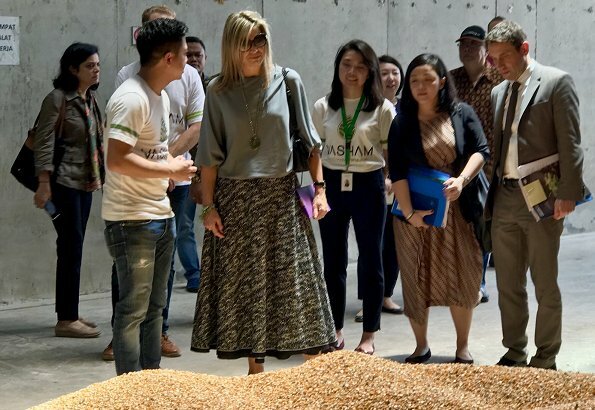 Then, Queen Máxima attended a discussion at a round table meeting with representatives of agricultural sector in order to talk about financing of farmers. Ha ha ha! I also don't like her skirt. On the first photo it looks as if she had a blanket round her hips. I agree and I wonder if her ladies in waiting don't tell her that perhaps flip flops are not the right choice to show up; good and confy during g travelling but after that she could have choose a nice a still confortacom pair of sandals but not this. She really needs a stylist! Just curious, I'd like to channel the complaints about Maxima's hair over to Crown Princess Victoria of Sweden whose hair is horrid, never styled and not attractive. Nobody compares to stylish Maxima but Victoria's hair drives me crazy. FOR GOD'S SAKE!!! I can't believe in your comments! She is in a working visit to a very poor country, to very poor people! And you only think of commenting her hair and her clothes! SHAME ON YOU!!! This is a royal fashion blog, what she should comment on? The Dutch policy over third world countries?? Cuánta hipocresía, Maria Edite Filipe, ¿Por qué no vas a ver lo que escribiste de la reina Letizia comparándola con Máxima? Ahora tienes que aguantarte cuando la gente comenta que su falda, su blusa y sus sandalias son horribles y que ella se cubre de joyas y se olvida de peinarse. Es lo que hay. She looks friendly, dedicated and, may I add, beautiful! She is dressed perfectly for this trip and the people love her warmth and appreciate her candor. Agree! Thank you for your words!!! I am so tired to these comments about her hair. We all know her own hair is miserable but we all also know that her hair dresser can conjure wonderful coiffures with extensions what she has when doing "queen" events. At these less formal ones she always go without hair dresser. I would have picked here nicer shoes and more colorfull clothes but I am happy she does not have here her Hollywood film star style. You said it, Blondini. I do agree. She has been in China, South Korea and now Indonesia - quite a trip and always shows enthusiasm and interest in the activities. I only disagree on one point: with all the travel her feet must be swollen and aching - whatever shoes are comfortable are the right ones. She looks good, although maybe sandals would have been nicer than flip flops. The outfit is appropriate for where she is, and her hair looks nice when she has it pushed back by her sunglasses. I really like the way she throws herself into her assignments with such enthusiasm. Ahhh Dios el cabello si es un desastre asi sea la reina Máxima. Ella es encatadora y en algunas ocasiones lleva prendas que solo ella sabe lucir. Entiendo que el evento no requiera la mejor etiqueta pero esa falda es espantosa, y combinada con esas sandalias o chanclas???? Ademas si es trabajo en una población vulnerable como se le ocurre llevar ese tipo de joyas??? ?